Officially titled "Springer Market Square", the public open space is located directly behind the historic City Hall building in downtown Kingston Ontario. This city was once the capital city of Canada and it abounds with history and fantastic stone buildings. Archaeological evidence indicates that an active market has existed on the site now known as Springer Market Square for over 200 years. Its form and function have changed over the years, but its basic purpose remains the same. A traditional centre of trade and commerce, the Kingston market has long provided area vendors a place to sell a range of wares and local residents easy access to foodstuffs and other goods. The market has continued to operate in Market Square and, over time, has evolved. What remains consistent is the vibrancy of trade on weekly market days during the spring, summer and autumn, when residents and tourists flock to Springer Market Square seeking fresh produce, meat and baked goods, plants and flowers, craft items and clothing, and antiques and collectibles. The Square remains alive on non-market days with concerts, evening film screenings and other public events. During the winter, skaters enjoy the refrigerated ice surface installed during the 2004 redevelopment of the square. This is an easy webcam because even if you don't have data, you can use the free wifi broadcast across the market square. I had a decent wifi signal while standing at the posted coordiantes. Visit on a Sunday and you might even find free parking across from City Hall or on the surrounding streets. We visited in March and enjoyed skating on the outdoor ice rink without the bone-chilling cold of early winter in Kingston. To log this cache, go to the posted coordinates, pull up the following webpage, wait until you get a clear shot of you at the coordinates, and take a screenshot. You must include a screenshot of you, taken from the webcam, with your Found It log. Regular photos are nice but a webcam screenshot must be included. 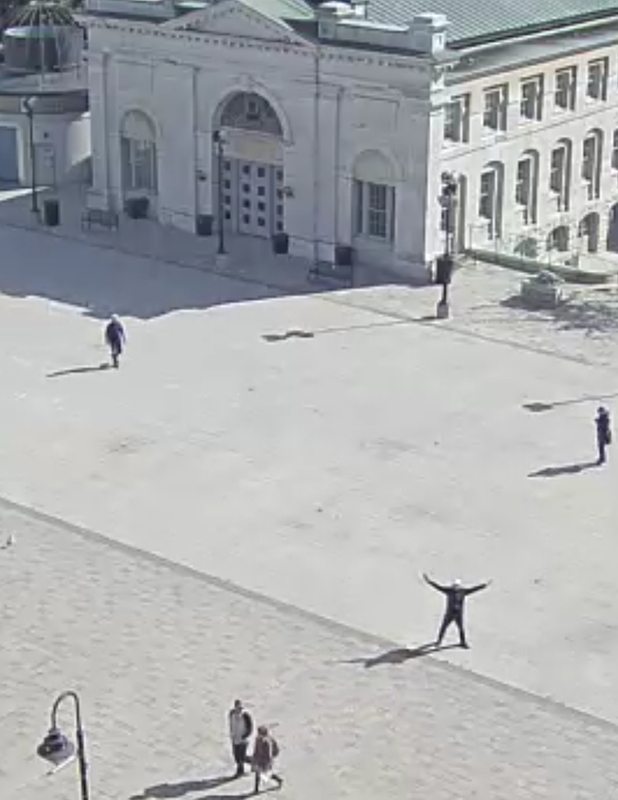 There is a short delay in the webcam feed, it's about 15 seconds, so wave at the webcam and then about 15 seconds later when you see yourself waving, get the screenshot. Day 13 of our vacation in Canada coming from Germany. Today was dedicated to visiting Kingston and doing a thousand island sightseeing cruise. Just before departure of our ship we explored the surrounding and found this nice webcam cache without any visits yet. What a pitty, time to change that. Its me on the picture with the arms spread! Thanks for this cache.